I finished a quilt top today. The bulk of the work was completed during our Sew In Day for Charlotte Modern Quilt Guild this Saturday. It was my first Sew In and it was as wonderful as expected. Four hours to sew, look at what other people are sewing and talk about sewing. Amazing! 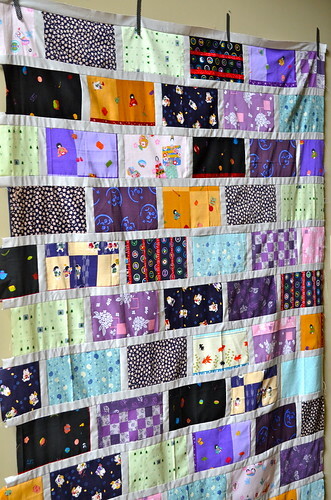 This quilt has been a long time coming. I've had the bricks cut out for the whole summer. The pattern is from Rachel's Colorbricks Quilt Along. I love how the big bricks showcase the fabric. This is definitely fabric that needed to be shown off. 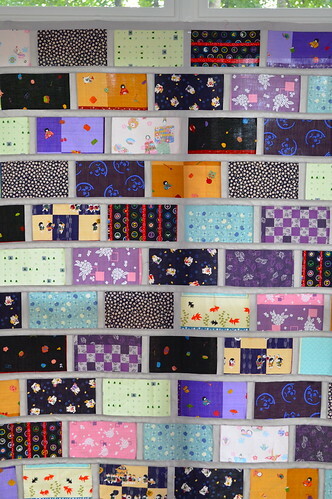 My friend Rebecca collected all of these cool handkerchiefs during the year she spent teaching in Japan. I used Kona Ash for the sashing/mortar. It was a little scary cutting into something so precious and so irreplaceable. But an honor to get to do so! Now I just need to baste, quilt and bind this baby before she gets to town for Thanksgiving! When I do, I will share some more detailed photos of the fabrics. There are some really amazing prints in there! It turned out great Courtney!